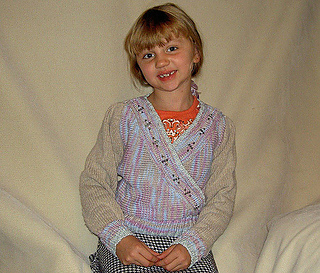 The free Woolworks version of this pattern is just notes based on the prototype of this sweater that I originally knit for my own daughter. I later wrote this up with complete instructions for children’s sizes 5/6 to 14 for the wrap-around sweater and legwarmers, and published it as part of my Maggie’s Rags line of knitting patterns. Information on the published version, available for purchase through retail stores, can be found at the Maggie’s Rags website.